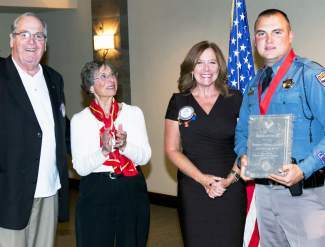 From left, Bob Hickey, president of Eagle Rotary; Liz Keay, president of Vail Rotary; and Pam Beaudin, president of Edwards Rotary present Trooper Shane Gosnell from the Colorado State Patrol with an award at last year's Public Safety Awards ceremony. EAGLE COUNTY — The Eagle County Rotary Clubs of Eagle, Edwards and Vail, in conjunction with the Eagle County Public Safety Council, are pleased to announce the second annual Public Safety Appreciation Awards night to honor Eagle County’s most outstanding first responders. The program was created to provide an opportunity for the men and women in public safety to be recognized for outstanding service to their communities and contributions to their profession. The winners will be recognized at an awards ceremony on Sept. 10 at the Donovan Pavilion in Vail. Tickets to the event are $45 per person or $500 for a table of 10 (which includes sponsoring the attendance of a first responder). Cocktails start at 5:30 p.m., followed by dinner at 6:30 p.m. The awards ceremony will begin at 7 p.m. Seating is limited. To buy tickets, call Joe Peplinski 970-376-1635 or email josephpeplinski@comcast.net. Tickets may also be purchased online at bit.ly/PSAwards2015. In addition to agency internal nominations, nominations are also being sought from citizens to recognize outstanding public safety professionals, whether serving in career or volunteer capacities. Nominations may be submitted for sworn law enforcement, fire, emergency medical services personnel as well as non-sworn public safety personnel. 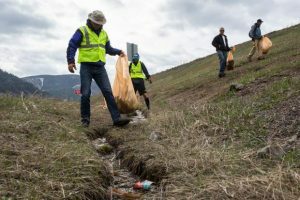 Award categories are not intended to recognize employees for merely “doing a good job,” or responding to a call, but to recognize employees who actually go beyond the ordinary to protect Eagle County’s citizens and property, or who contribute significantly to the public safety profession. Nominations must be submitted on the official nomination form. Please limit nominations to approximately 500 words. Attachments such as articles, brochures and photos are encouraged. Completed nomination forms must be submitted by 5 p.m. on Aug. 15. For questions or to request a nomination form, contact Joe Peplinski. Nomination forms may be submitted via email, regular mail to P.O. Box 397, Vail, CO 81658 or via fax at 970-845-9309.